Nor do I pretend to be one. I simply provide these forms as a courtesy as they are the ones I see most often. I am unable to give advice on these forms or the use of these forms in any given situation. If you are unsure of which form you need, I would suggest you confer with a licensed attorney who can lead you in the right direction. 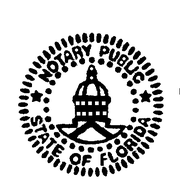 Notary Forms - Some of the more popular forms. I typically carry most of the needed forms with me at all times however, I have put the most popular forms that I run across on a regular basis up as a courtesy and they can be downloaded by clicking on the appropriate file name below. They are in PDF format and can be easily printed on any printer. Power of Attorney You may download several variations of the POA at this link. VIN Verification Form - Direct PDF download from Florida DMV at this link. Acknowledgement 1 Signer - Loose certificate FL Acknowledgement for a single signer. Acknowledgement 2 Signer - Loose certificate FL Acknowledgement two signers. Jurat (Oath) 1 Signer - Loose certificate FL Oath for a single signer. Jurat (Oath) 2 Signer - Loose certificate FL Oath for two signers. FL Attorney-in-Fact affidavit - Loose certificate for the principle of an attorney in fact as requested by third parties. General Affidavit - Download this fillable affidavit and open it in Adobe Reader or Acrobat. Type your sworn statement, print out the form and have your signature notarized. For a single signer. VIN Verification Form - This form is required by FLDMV for VIN verifications. Feel free to contact me directly at (863) 698-3793 should you require my services.